Frank as a baby. 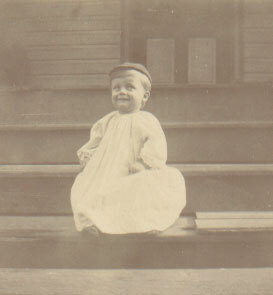 Frank Bush Marshall, named after his father, was born 29 June 1925 to Frank and Catherine Marshall in Baltimore, MD. He also had a younger sister, Betty. A rather precocious child, Wunderkind in the parlance of his forebearers, young Frank excelled in school. Frank attended St. John's College in Annapolis, MD. He served in the Allied occupation army after WWII. 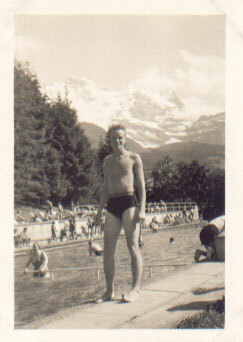 Strapping young Frank with Jungfrau (in the Swiss Alps) in the background. 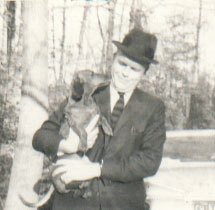 Frank holding the family dog Liebchen in 1967. Frank married Ruth Gertrude Thompson 17 September 1949 in Severna Park, MD and lived there for the rest of his life. His first child, a son, died as a baby of a brain tumor. Later he had two daughters, Amy and Sally. He worked as a stockbroker for Alex Brown in Annapolis. Frank's five grandchildren called him "Pop". He was a smoker, a habit which cost him his life. He died 26 March 1992 in a hospital in Annapolis, MD of emphysema. 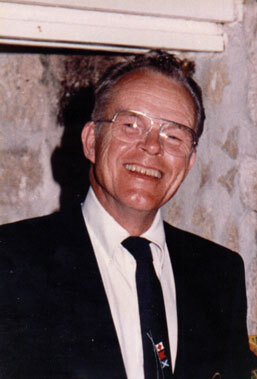 Frank in his elder years. Amy Christine Marshall 1953 - ? Sally Elizabeth Marshall 1955 - ? Last changed on 16 May 2004 by Bradley James Wogsland.